The Palomar College Arboretum has over 20 species of figs (Ficus), including the Palmer fig (F. palmeri) native to Baja California, rock fig (F. petiolaris) native to mainland Mexico, the sacred Bo tree (F. religiosa) native to India, the sycamore fig (F. sycomorus) cited in the Bible, and the large-leaved Roxburgh fig (F. auriculata) native to the Himalayas. We have several large specimen trees, including the Moreton Bay fig (F. macrophylla) native to Australia and the Mysore fig (F. mysorensis) native to southern India. Some of the figs in our collection are 'stranglers' in their native habitat. They completely wrap around a host tree like a giant botanical boa constrictor, eventually shading out and replacing the original tree. Other trees are banyans in their native habitats, with numerous prop roots hanging down from the spreading limbs. The fig story is very complex and literally thousands of peer-reviewed articles have been published. 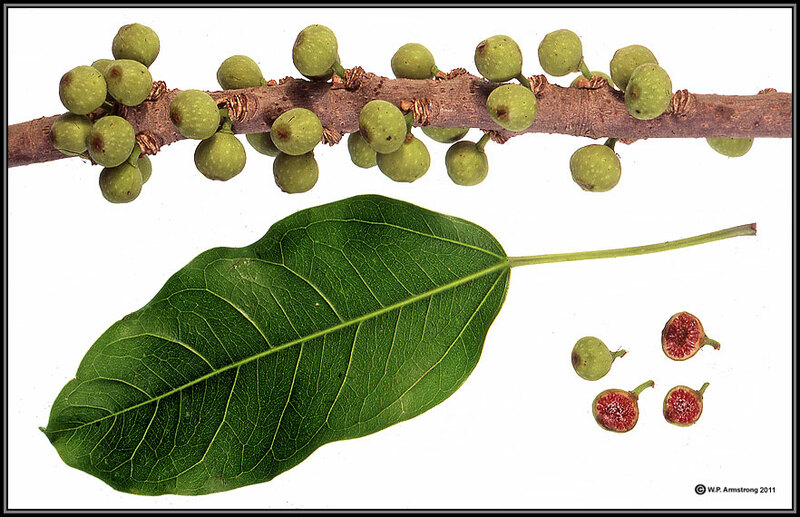 For more information on the fig and fig wasp, please refer to the Wayne's Word Fig Index page at https://www2.palomar.edu/users/warmstrong/figlinks.htm. The sacred bo tree (Ficus religiosa) native to India and southeast Asia. 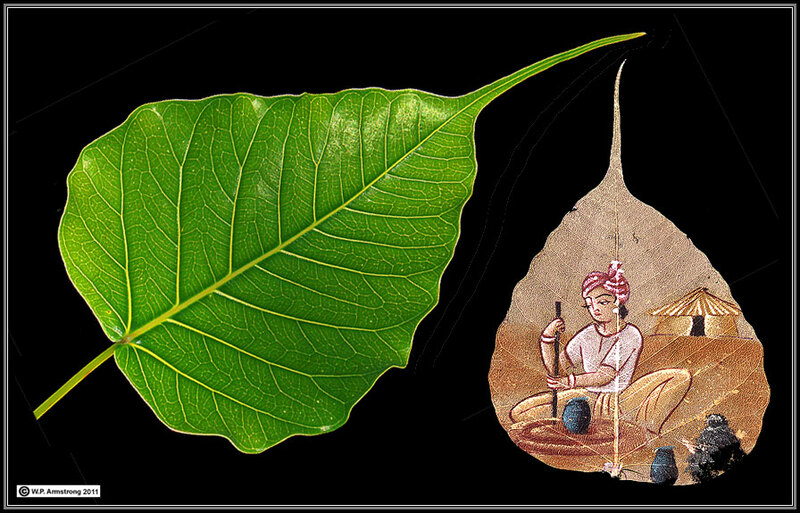 Right: The skeletonized leaf of a bo tree with a lovely painted scene. The bo tree is sacred in the Buddhist and Hindu religions. The leaf was sent to this author from a former student traveling in India. Massive trunk and surface roots of a Moreton Bay fig (Ficus macrophylla) in the Palomar College Arboretum. 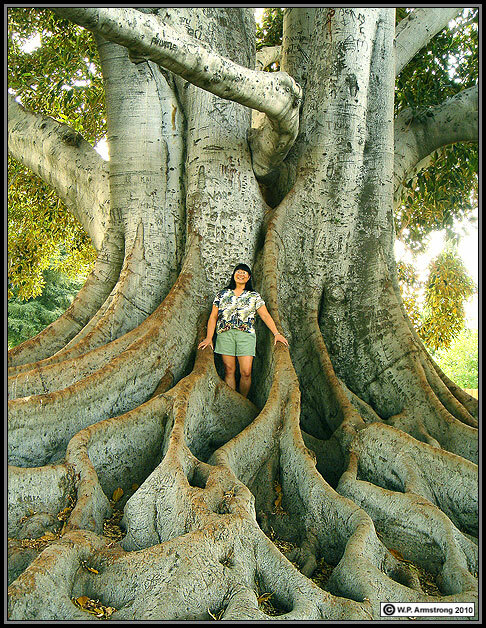 This is how large a Moreton Bay fig (Ficus macrophylla) can get in just over one century in southern California! It was planted in Glendora, California in the late 1800s. The enormous surface roots cover 1200 square feet (40 square meters). In its native habitat of eastern Australia, this species becomes a gigantic strangler. Mysore fig (Ficus mysorensis), a large fig tree native to the state of Mysore in southern India. Leaves of the Mysore fig have an abruptly acuminate (pointed) apex that is sometimes called a "drip tip." The orange syconia of Ficus mysorensis in the Palomar College Arboretum. This is a strangler fig native to the state of Mysore in southern India. The colorful syconia are lined on the inside with minute male and female flowers. In its native habitat, the female flowers are pollinated by tiny symbiotic wasps. 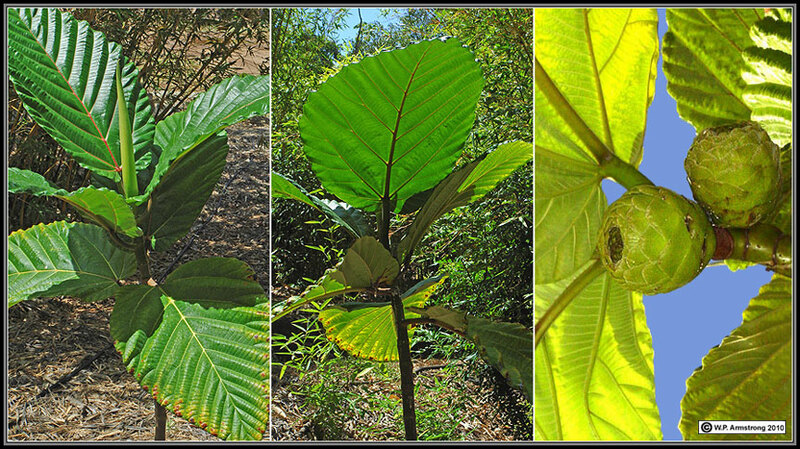 Leaves from four large fig trees in the Palomar College Arboretum. 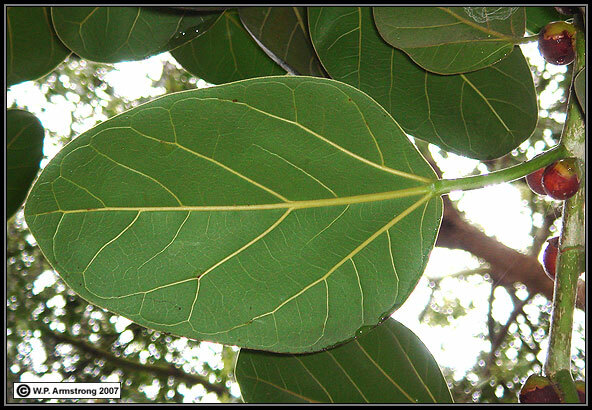 They have the typical venation and shape of Ficus mysorensis, including an bruptly acuminate apex. They do not match the venation, shape and blunt apex of Indian banyan leaves (F. benghalensis). Right: Ficus bengalensis. Illustration modified from Ficus: The Exotic Species by I.J. Condit, Univ. of California Press, 1969. 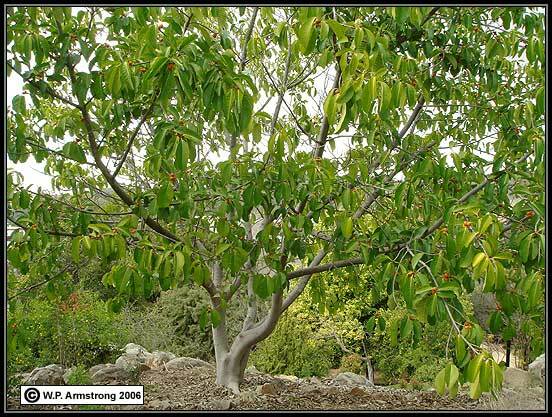 The large orange syconia and abruptly acuminate leaf apex (red arrow) of this fig at the top of the hill in the Palomar College Arboretum is typical of Ficus mysorensis. 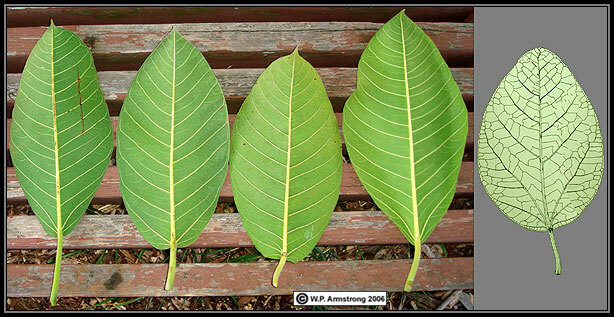 Leaves of the Indian banyan (F. benghalensis) typically have a blunt apex and a different vein pattern. See next image. 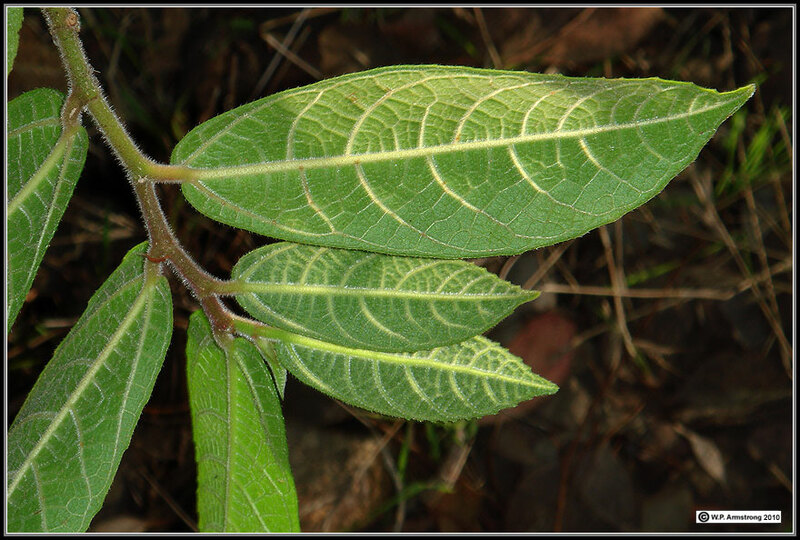 The leaf shape and venation of Indian banyan (F. benghalensis) is quite distinct. 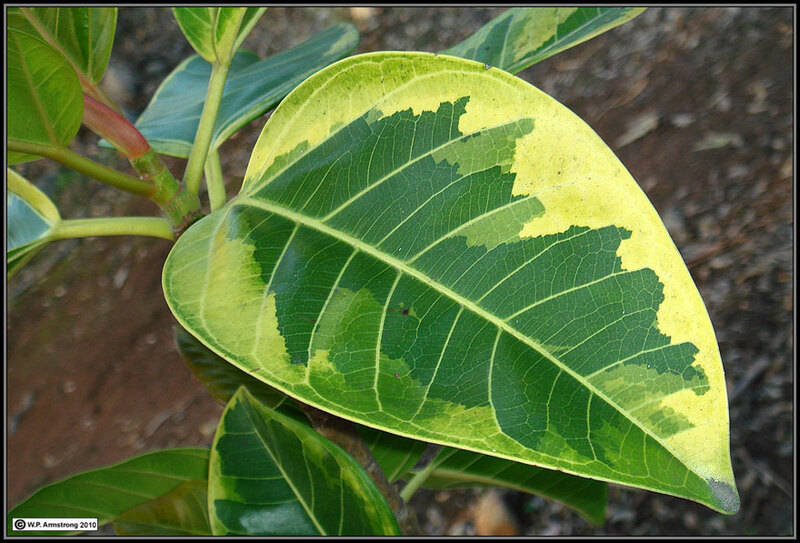 Striking leaves of the variegated cultivar of the Indian banyan (F. benghalensis 'variegata'). A small specimen of this tree grows at the top of the hill overlooking the Arboretum. 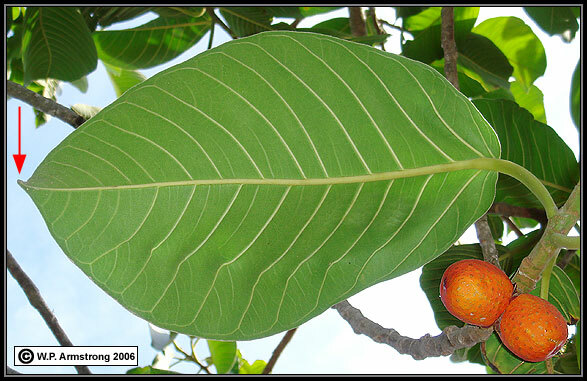 Left: Narrowleaf fig (F. binnendijkii 'alii'), an unusual species native to Java and the Philippines. Right: The large-leaved Roxburgh fig (F. auriculata) native to the Himalayas. Two closely-related species of Ficus native to Mexico: Ficus petiolaris from the mainland (left) and F. palmeri endemic to the Baja California peninsula (right). Baja California began to separate from mainland Mexico about 10 million years ago. This resulted in isolation and speciation on the Baja Peninsula, and undoubtedly explains some of the differences between present-day F. palmeri and the similar mainland F. petiolaris. Another lesser known Baja California endemic is F. brandegeei that grows on vertical rock walls of the Sierra de la Giganta west of Loreto. It is very similar to F. palmeri, except it leaves, branchlets and syconia are glabrous. Richard Felger and Charles Lowe (1970) have changed the taxonomic status of these figs to subspecies of F. petolaris. According to E.M. Piedra-Malag�n, V. Sosa, and G. Ibarra-Manr�quez (Systematic Botany 36(1): 80-87, 2011), F. petiolaris, the first name in this complex, is the only species that should be recognized, with a wide distribution from Sonora to Oaxaxa and in Baja California. Syconia of Ficus sycomorus. These structures are NOT galls. They are fleshy structures lined on the inside with hundreds of tiny male and female flowers. They are essentially an inside-out flower cluster (inflorescence). The syconium in center has been sectioned to show the numerous flowers on the inside. Although this species of fig has its own pollinator wasp (Ceratosolen arabicus), there is also a nonpollinator wasp Sycophaga sycomori that lays eggs inside the short-style flowers. Oviposition and the presence of nonpollinator wasp larvae not only initiate the development of endosperm tissue, but also the enlargement and ripening of the syconium containing wasp-bearing drupelets without pollination. Since the normal course of events is to abort unpollinated syconia, the entire syconium could be viewed as a gall occupied by nonpollinator wasps. 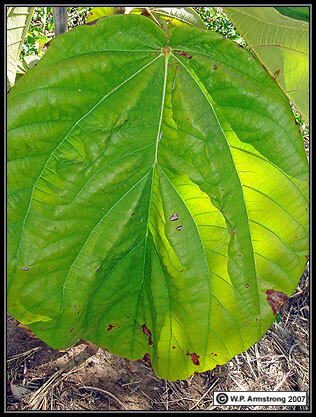 Ficus dammaropsis, an unusual fig from the rain forests of New Guinea, has large leaves up to two feet (0.6 m) wide and three feet (0.9 m) long. The leaves are used by indigenous people of New Guinea for wrapping pork and for lining their cooking ovens. 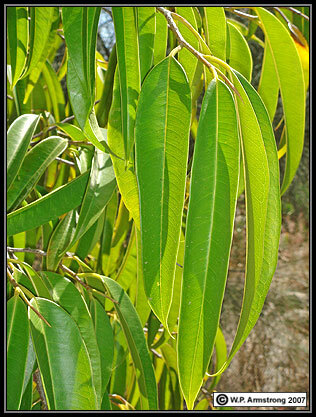 The bark is used in making string and head coverings. A baseball-sized syconium (multiple fruit) is also shown in the right photo. According to A.B. Graf (Tropica, 1978), the syconia are harvested by native Melanesians of Kikiepa, New Guinea. 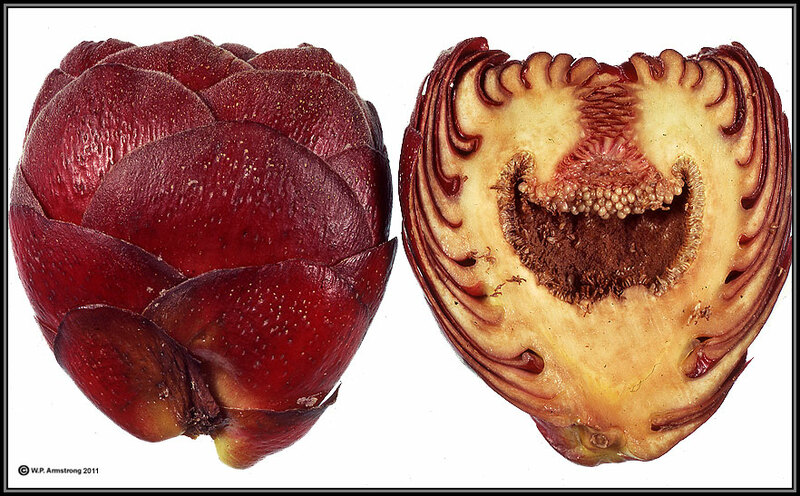 Because this species is so unusual among figs, it was once classified as a separate genus and species Dammaropsis kingiana. Ficus dammaropsis from the rain forests of New Guinea. 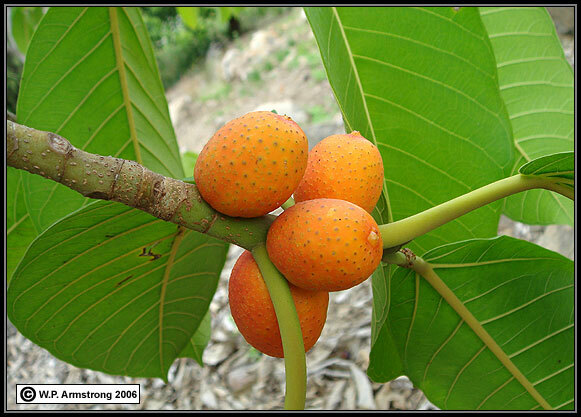 It was once placed in the genus Dammaropsis, but its multiple fruit is clearly a large syconium typical of the genus Ficus. 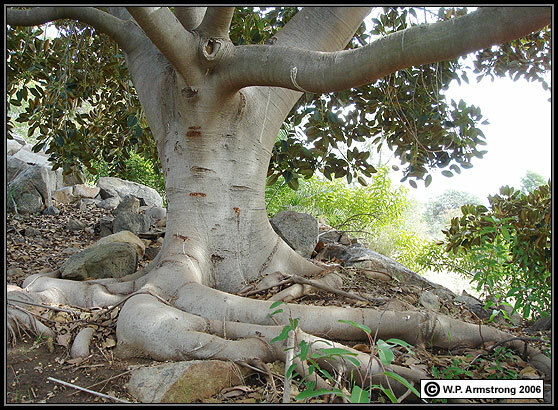 A. Ficus virens from New South Wales, Australia. B. Originally identified as F. superba, this could be another F. virens. Both of these specimens are small trees at the top of the hill overlooking the Arboretum. They develop as stranglers in their native habitats. Ficus virens from the campus of UC Riverside. 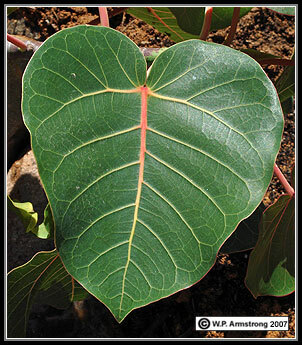 A. Ficus natalensis native to tropical east Africa. B. Note the aerial prop roots developing from the main trunk. A. 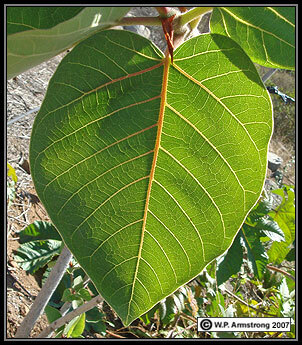 This tree was originally identified as a rustyleaf fig (Ficus rubiginosa); however, the leaves do not have the characteristic brownish-red underside of typical F. rubiginosa in San Diego County. B. Ficus ingens native to South Africa. 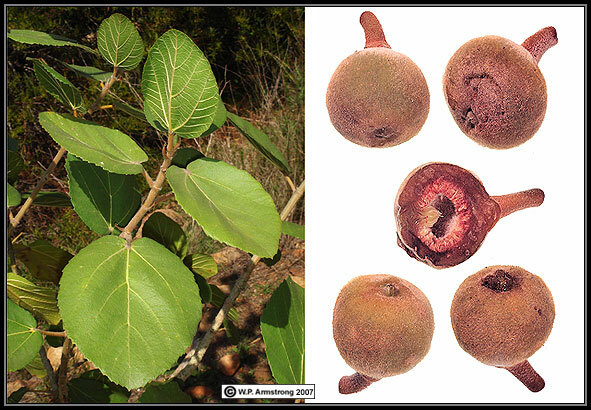 Sandpaper fig native to Queensland, Australia. Short, stiff hairs give the upper sides of leaves a rough, sandpaper texture. The botanical name that describes this type of pubescence is "scabrous."